Orient, unreadable scriptures which are pure Chinese to us , rice and fried food, chopstick, bike, great wall and forbidden things (like the City). 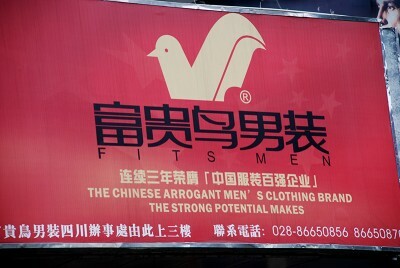 While in China, we talked about “Chinglish”, the Chinese English that sometimes is a little bit hard to understand and can be very funny sometimes. We already published a fine example of English translation “free style” and while going through our pictures recently, we found a few more examples, that we really think deserve to be shown to the world as they are highly intriguing, creative and most of the time hilarious. Poor Grass! Luckily they have a nice sign to protect them! 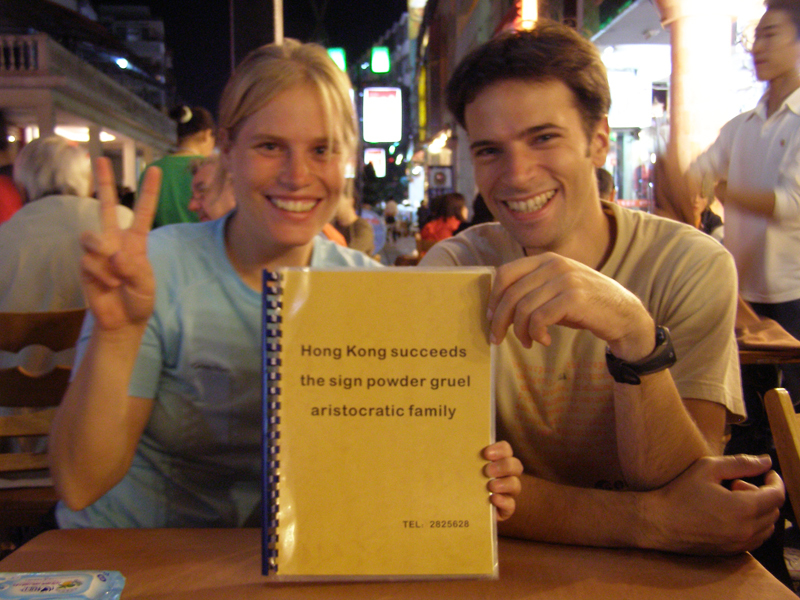 The picture below (sorry for the quality) definitely shows one of the finest examples of Chinglish we encountered, a restaurant named “Hong Kong succeeds the sign powder gruel aristocratic family” at Guilin. We think that even Google would have translated this better!! But then, in China access to Google is forbidden. That maybe explains some things. No idea what those words all together mean! 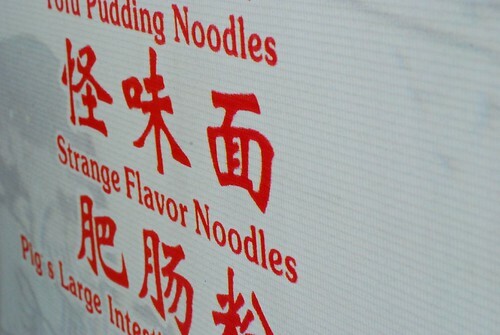 Unfortunately they ran out of “Strange Flavor Noodles” so we didn’t get a chance to try them. Too bad! 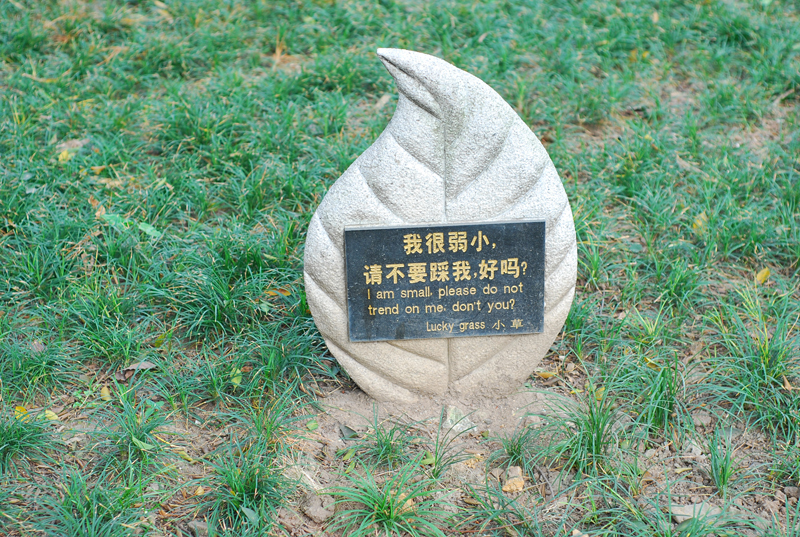 For a related article on Chinglish, see our first impressions on China. China hasn’t been our favorite country so far, which is partially due to the fact that we had bad weather in the north and the fact that we couldn’t get into Tibet even though we tried so hard. But it’s not very fair to judge it so easily, as China definitely has some “worth seeing” sites, although it is sometimes just a little bit hard to find them. But that’s part of the adventure! Now that we have been in China for a little while, we can maybe speak a little bit about the Chinese, because they are actually quite different from the people we met in Russia and China. Whereas the Russians were still very European and the Mongolians “Mongolian” (we don’t really know how to describe them but we agree that they are not European, but also not Asian), the Chinese are something different, something peculiar in their own kind. Probably the best way to visit Beijing is by bike. At least compared to buses (continuously stuck in traffic jams) or by foot (by foot??? Do you have any idea how big this city is???). And as Beijing is flat like Holland it is not too hard neither. So for 3 days we rented some high-tech made-in-China bikes to explore the city and really merge with the locals joining the bicycle-buzz visiting among others the Summer Palace, the Ancient Observatory and the Lama Temple.